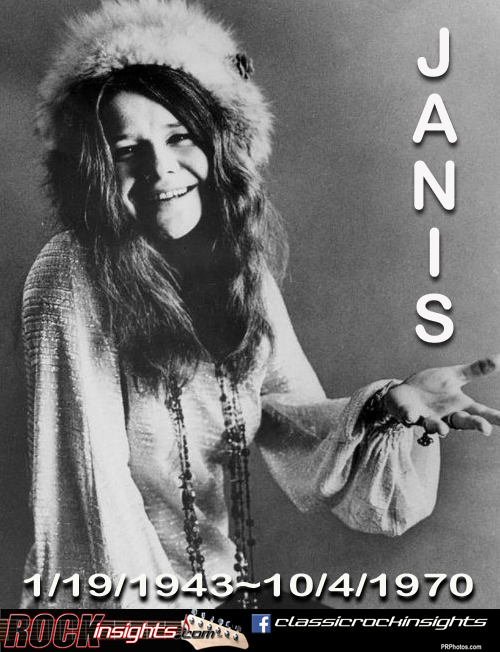 Janis Lyn Joplin was born on this day in Port Arthur, Texas in 1943. A combination of alcohol and heroin would cut her career and life short in October, 1970. Pearl, just her 4th album, would be released posthumously just before what would have been her 28th birthday in 1971. Though tragic, her early death was not all together shocking given her hard, fast lifestyle and frequent periods of heavy drug and alcohol abuse. The death of another Rocker born on January 19th (1949) did come as a shock. The always sharp dressed and clean cut singer Robert Palmer died after suffering a heart attack at 54 in a Paris hotel room in September, 2003. Musicians lost on this day include pioneering Rocker Carl Perkins (1998) and the legendary Wilson Pickett (2006). On 1/19/1993, a reunited Fleetwood Mac performed at Bill Clinton's inauguration. Aerosmith's Steven Tyler took a seat as a judge on this night in 2011 on the opening show of the 10th season of American Idol.